Rain, hail or shine, Lourdes delivers the Beacon faithfully each month, to the 190 letterboxes in her delivery round. Well, maybe not hail. But if it’s raining she’s out there with her rain poncho on, cheerfully delivering circulars to her letterboxes twice a week. She says it normally takes her about an hour, but it all depends on how many dogs she stops to pat, or neighbours she stops to talk to. Lourdes has gotten to know many people over the fifteen years she has been walking her route; she knows who shifted, who sold and who passed away. She even knows the names of the dogs and cats, many of whom greet her for a pat or a scratch. 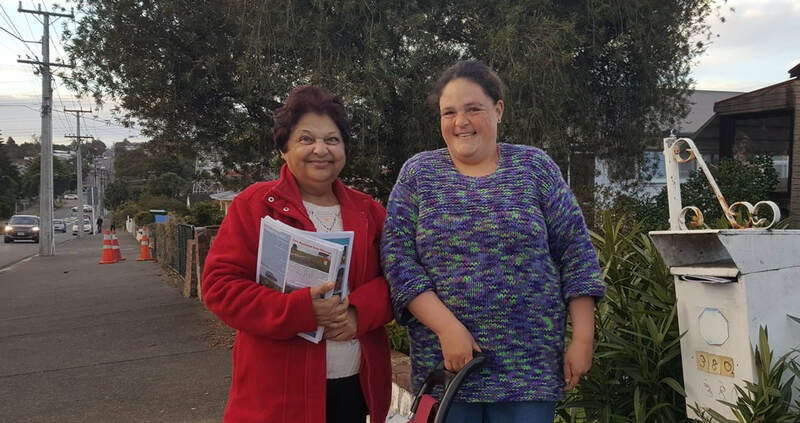 When she first started as a 15-year-old Lynfield College student, Lourdes’ mum Sandra helped her, and they did two rounds together. With Sandra’s health not what it used to be, they decided one was more manageable. Lourdes came from Delhi to New Zealand as a eight-year-old, along with her mum and dad and extended Anglo-Indian family. She was a precious girl in a family which was extremely good at producing boys. Sandra and her husband Clive were both teachers, and taught in Ethiopia and Kenya in the early years of their marriage. After nine years with no sign of children, Sandra went to Lourdes in France in hope of healing. Baby Lourdes came along two years later. Sandra is justifiably proud of her kind, hardworking daughter, who was awarded the Girls Brigade Queens Award in 2006. Among other criteria, the award involves hours and hours of volunteer service, as well as an in-depth written assignment. Both Sandra and Lourdes are keen knitters and for the past eight years have knitted for Middlemore’s Kidz First Childrens Hospital. Last month they knitted 136 pair of booties. Sandra says that as a teacher for many years in Otara, her heart is with the poor in South Auckland. 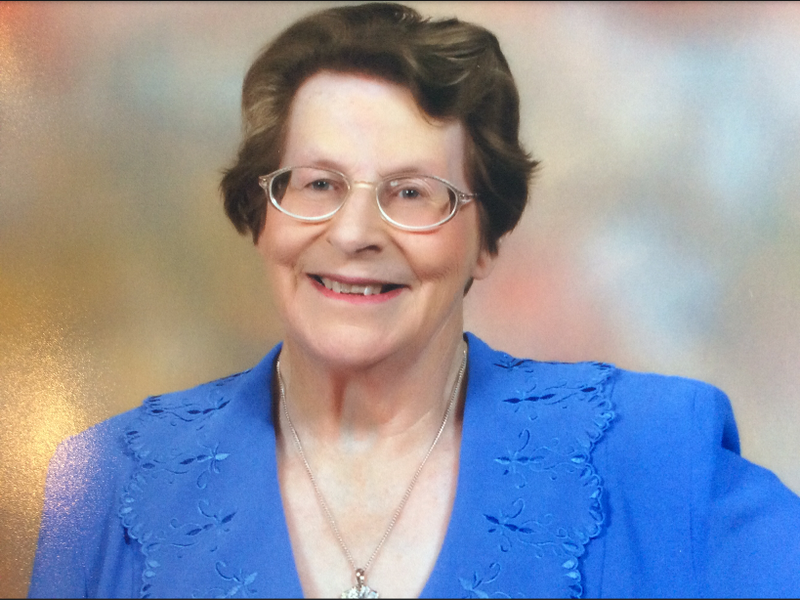 Mrs Elizabeth (Betty) Noffke, is to receive a Queen’s Service Medal for services to music. One of the best-known musical identities in our area, Betty became a registered music teacher in the early 1980s and over the years has taught piano to many young people of Blockhouse Bay and the surrounding areas. Betty convened the West Auckland Student Performers Group for many years to improve access to performance opportunities for young students in the area, and launched the West Auckland Performing Arts Competitions (WAPAC) in 1990. Through her 30-year involvement with the Blockhouse Bay Community Centre where she has also been an active committee member for the entire time, Betty, along with Robyn Barnaby, the Centre manager at the time, led the initiative to acquire a performance-standard grand piano (1990) for the Centre for the staging of WAPAC. Betty was elected to the Institute of Registered Music Teachers (IRMT) Board in the late 1980s, and also spent 12 years on the National Council. She convened the centennial conference in Auckland in 2002 for which she also compiled and wrote a history of IRMT in Auckland. Betty spent 11 years writing a book, A distinguished New Zealand Tenor, a biography about her father Ramon Opie, also a QSM for services to music. She also spoke about her father’s life and works on the Blockhouse Bay Living History Project DVD at the Blockhouse Bay Library. Betty continues to teach a studio of piano students from beginners to accomplished learners. Bra Pong? Booby Biscuits? “How rude!” you might be thinking. But of course, when it’s a Pink Ribbon event it’s all about the ‘boobies’ and keeping them healthy, and celebrating the advances made in cancer research. And sadly, breast cancer is something that many people can personally relate to. The Blockhouse Bay Pharmacy’s annual Pink Ribbon breakfast blasted off in May - though not technically a breakfast, rather an all-day event involving anyone and everyone who wanders into the pharmacy. The staff all baked up a storm the night before, resulting in a table loaded up with date scones, cupcakes and slices, and of course the Booby Biscuits as the hot favourites. The result was a slightly pink looking café with mad games and customers being enticed to play – and pay. Bra Pong has become THE game, with local business teams playing off against each other and the funds going up with each toss of the ping pong ball. Some very large and gorgeous bras adorn one corner of the shop, each having different values, with the aim to attain the highest score using three ping pong balls. The champions this year were the Barfoot ladies team, with their men’s team limping in behind them… more bra expertise needed perhaps? But there were no booby prizes in this event - the ASB and the Bay Law ladies fielded very competitive teams, most going home with spot prizes donated by the pharmacy’s suppliers. A lovely local family from Donovan Street were the winners of the raffle prize this year, which was stuffed full of treats from vitamins to cosy slippers and a hot water bottle, perfumes and make up, sporting goods and hair products. The pharmacy staff spent months cadging goodies for it from their generous suppliers. The team at Blockhouse Bay Pharmacy thank all who participated in the spirit of generosity and fun. With the baking all sold out plus a good whack of donations, the funds for the day came to $896.00. 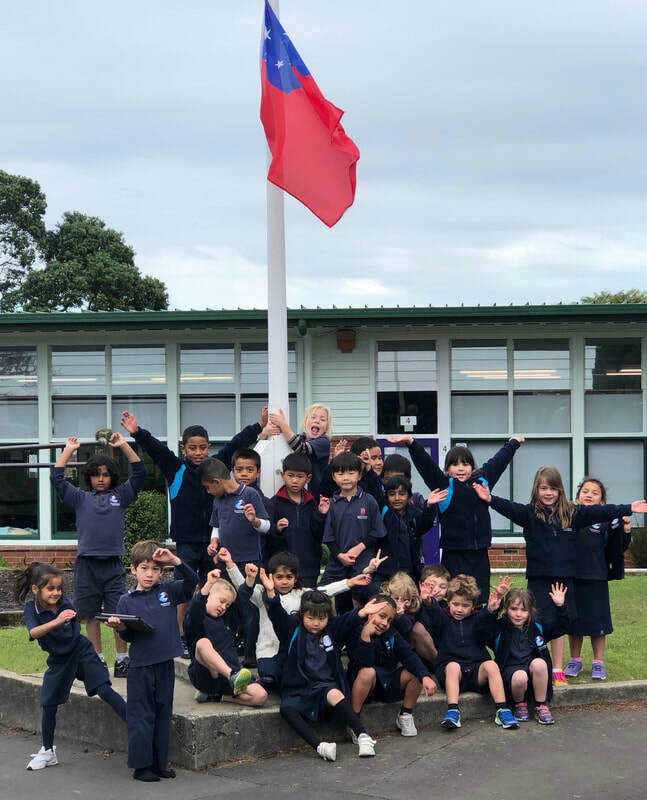 Mrs Timoteo and Room 17 made Koko rice - a delicious Samoan-style rice pudding. The abuse of elders by caregivers is a worldwide issue. June 15 is World Elder Abuse Awareness Day (WEAAD) and to highlight this, Indian social group Bhartiya Samaj hosted an event to honor their elders and bring the community together. The event was well-supported with more than 250 in attendance, including seniors, dignitaries and volunteers. Some of the dignitaries present were Hon. Michael Wood, List MP Hon. Kanwaljit Singh Bakshi, National List MP Ms Parmjeet Parmar, Labour List MP Ms Priyanca Radhakrishnan, Honorary Consul of Fiji Mr Harish Lodhia, Honorary Consul of India, Mr Bhav Dhillon, GOPIO President Ms Shefali Mehta QSM, Bhartiya Samaj Patrons Hon. Dr Bruce Hucker QSO and Hon. Dr Ashraf Choudhury QSO, NZ Police Personnel District Commander Auckland Ms Karyn Malthus, Asia Liasion Co-ordinator Ms Jessica Phuang, Inspector Grant Tetzlaff, Constable Mandeep Kaur, Puketapapa local board Chairperson Mr Harry Doig and members Mr Shail Kaushal, Ms Ella Kumar and Ms Anne-Marie Coury, Managing Director Bank of Baroda Mr Anupam Srivastava, Team leader Research Centre Auckland council Ms Smita Biswas, EO of Age Concern North Shore Ms Janferie Bryce Chapman, Bhartiya Mandir President Mr Hemant Prashar, Shri Narinder Singla and executive committee members of Bhartiya Samaj. The senior citizens group performed a short play on common abusive scenarios faced by many elders (sadly often within their own families). This was followed by a video of children enacting a play on seniors being kept at old age homes, and short video interviews of community members sharing their own experiences in understanding these abuse situations and advising on precautionary steps to tackle them effectively. A sumptuous lunch complemented the event which was a huge success by Bhartiya Samaj Charitable Trust in their efforts to socially engage the community. 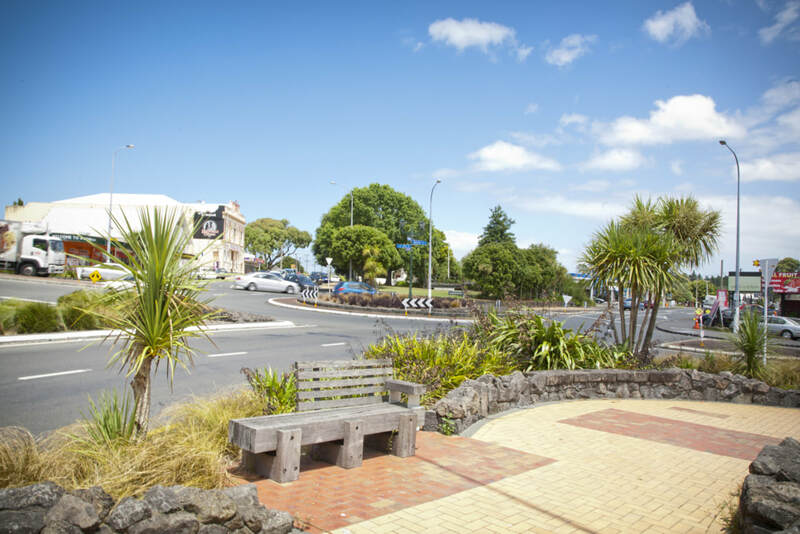 Whau is set to receive an investment boost for the environment, transport, public facilities and future development as a result of Auckland Council’s newly agreed 10-year Budget. The $26 billion budget sets out an historic level of investment in Auckland, with transport infrastructure, environmental initiatives and other projects in line for funding to keep pace with Auckland’s growth. Cr Clow and Chair Mulholland wish to thank everyone who provided feedback on the budget. Editors note: The above budget figures were correct at time of writing, and were scheduled for sign-off 28 June 2018. Another inspiring day for Blockhouse Bay-Lynfield Lions who sponsored Young Speechmakers Hanh (Fiona) and Linda (Ruije) to the Lions Region 2 contest in Warkworth. Each of the contestants chose weighty subjects, reflecting their own and peers’ concerns of the world today; Rujie (Linda) from AIC College advocated more youth involvement in politics and Hanh (Fiona) also from AIC College recommended spending more time on now instead of being too busy. 3rd Ming Yang Li (Takapuna Grammar, sponsored by Devonport Lions). 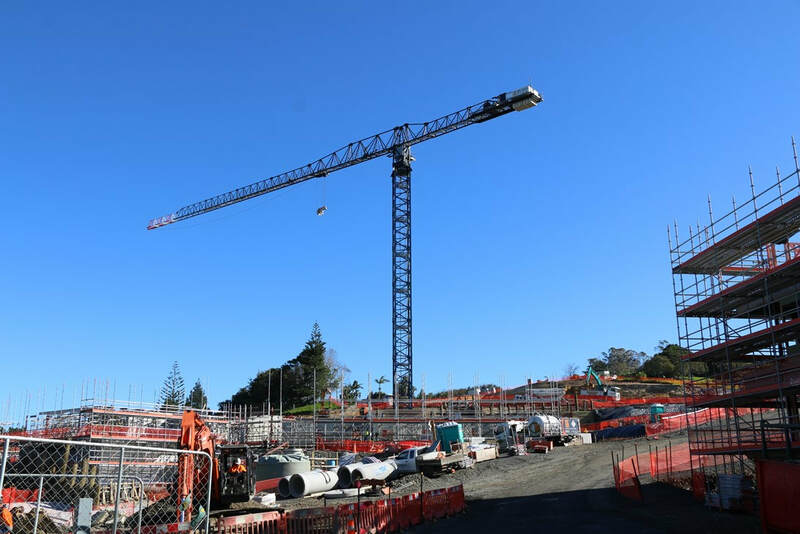 It’s a rare thing for Lynfield to have such a sizeable construction site in its midst, with the installation of the 48-metre-tall tower crane at Ryman Healthcare’s new retirement village build believed to be a first for the area. The crane, known as a hammerhead crane, has a 70 metre working arm, or horizontal jib, it weighs 350 tonnes and its foundation runs more than 10 metres deep, says Project Manager David McKearney, who is heading up a team of around 160 workers. “The crane is situated on the left of the Commodore Drive entrance where the village centre is being built and will be able to reach over the distance for standing up the precast concrete panels, really accelerating the work on the construction of that building,” David said. The village centre includes all the communal areas such as the lounge, dining room, swimming pool, gym and hairdressing salon, and is also the location of the care centre which includes rest home suites, hospital and dementia care and serviced apartments. David said its construction posed various complexities due to the large footprint of the building, and the way its nine levels are staggered up the slope. “With the slope, it means there’s a lot more thinking involved, and you need to have really good planning in place. The concrete pours are so big they have to be done in two stages so that’s a lot of logistics and organisation,” he said. Across the driveway, the first independent block is already having the roof put on. Foreman for that block, Lafi Lemana, has worked for Ryman for 13 years and says his goal is to set a high standard of construction which will dictate the quality of the rest of the village. “If I can hand over something real mint and everyone’s happy it’s going to set the bar around here,” he said. The 2018 New Zealand Ice Hockey League (NZHIL) season is now three rounds down, and despite having the bye in the last round, the West Auckland Admirals maintain their position at the top of the League. The boys in blue opened their season away to the Dunedin Thunder, with a win and an overtime loss from the two games to secure four out of the available six points. Returning back to Auckland for the season home opener the following week, they matched up against the Southern Stampede from Queenstown, in a repeat of last year’s Birgel Cup Final. The Southerners won the Birgel in 2017, so this was always going to be a marquee date in the NZIHL calendar. The Admirals settled into their work early, and took a 2-1 lead into the first period break on the back of goals to import Craig Peacock, and outstanding New Zealand forward Frazer Ellis. After the teams exchanged goals in the second, the Stampede looked dangerous trailing by a goal, and took a man advantage power-play. But in fact it was the home team who scored short-handed, as Ryan Ruddle pushed the lead to 4-2, from which the Stampede never recovered. 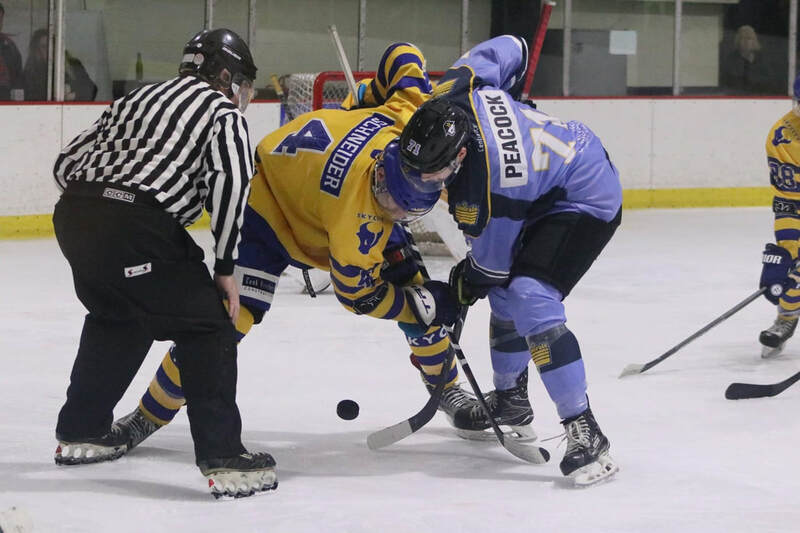 After the hard-fought clash on Saturday, it was clear that the defending champions, and class team of the NZIHL for the previous three seasons, would come out strong on the Sunday, and so it proved. Csaba Kercso-Magos Jr got the start in between the pipes for the Admirals, whilst Ice Black Callum Burns was ruled out for the Stampede after sustaining a shoulder injury on Saturday. Colin McIntosh also made way for the Stampede, giving Kory Helowka the import spot for what would turn out to be an eventful debut! It was again Ryan Ruddle who scored a big goal, taking a Phillips feed during four on four play and sneaking one past Daniel Lee in the Stampede net. Just two minutes later Justin Daigle walked the blue line with the puck and sent an exocet missile into the top corner for 2-0. The Stampede pulled two goals back to level the contest, before the longest serving crew member of the pirate ship, Gareth McLeish, did good work to keep the puck in the zone, and then threw his best change-up pitch on goal, with the dangerous floater sinking just at the right moment to settle in the net. Strike 3! The Stampede got into severe penalty trouble, with Helowka eventually being tossed from the game for penalties, and then abuse of the officials. Peacock once again took advantage and opened up the defence before a juicy rebound fell to Mike Verschuren, who gratefully accepted the open net in front of him. 4-3 Admirals. Shaun Harrison and Dylan Dickson added further markers, as the Admirals swept the home series to take all six points. The Admirals also took the first derby game away at Botany against the Swarm on June 16th, winning 5-4 in overtime, with Dutch import Mike Verschuren taking a five point haul with 2 goals and 3 assists. The big matinee game between the Admirals and the Botany Swarm, which doubled as the second game in that NZIHL round, was played on Friday 22 June at Spark Arena.